We are delighted to announce that co-operation between the Local Group and Notts Wildlife Trust has resulted in a £28k project funded by a combination of Heritage Lottery, Awards for All and Rushcliffe Borough Council. Simply grow more flowers! 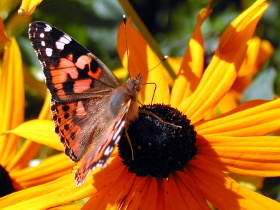 Native species are best and plants which flower early and late in the season are particularly helpful to insects emerging from or preparing for hibernation. Leave at least one patch of your garden to grow wild. This might look a bit scruffy to you, but it will provide habitat for your pollinating insects to breed, lay eggs and raise their young. Cut your lawn less often and let the grass grow longer to allow nectar-rich plants such as clover to flower and feed pollinators. 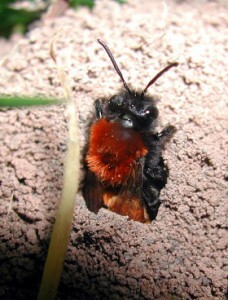 Avoid disturbing places where pollinating insects may be nesting or hibernating. 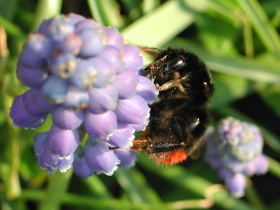 Most apart from honey bees live in the wild and hibernate or nest in holes in trees, walls, rotting wood or by burrowing into loose soil – careless garden tidying in winter can destroy next spring’s pollinators! Avoid using pesticides. Check your garden regularly so you can spot problems while they can be controlled by physical methods – hoeing; removing infected plants or parts of plants. If you have to use a pesticide keep quantity used and area covered to a minimum. See the Bees’ Needs website for more on this topic.